Through our community engagement over the last four years the DVA has extensively explored the inter-relationships between diverse professional interests in developing advocacy on critical community issues. We have primarily done this through our DVA “Quilting” process, where the overlay of insights gleaned from our roundtable process creates summary encapsulations of key points for policy and action in public and private implementation. 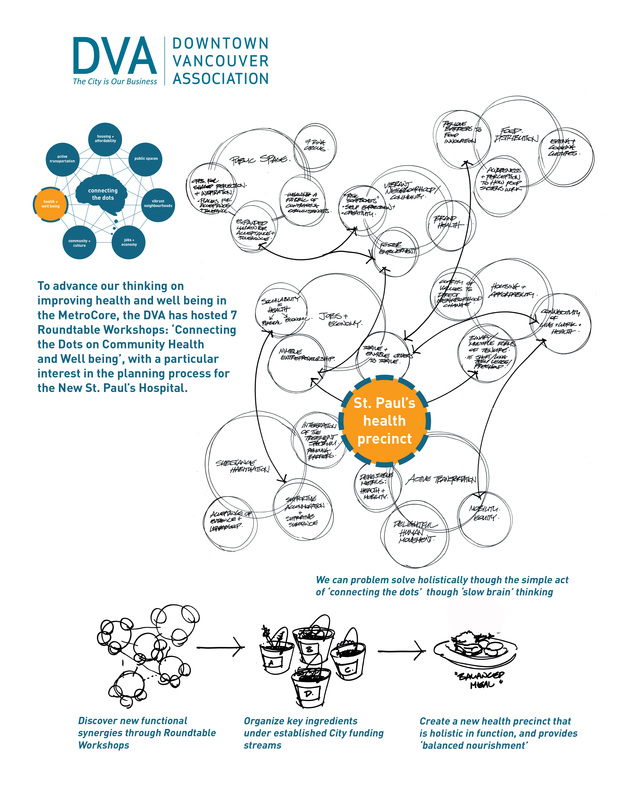 Thinking ahead of the current New St Paul’s planning process, in late 2015 we convened seven roundtables exploring community health and well-being, from a diverse range of perspectives. This led to early engagement with the New St Paul’s and False Creek Flats planning teams, to ensure that several common themes that arose in our roundtables, be carried forward in the City’s and Providence’s thinking. Our workshop with the City and Providence of April 20 strongly conveyed the importance we had gleaned of community well-being having a lot to do with the empowering nature of the public realm, to, through and around large precinct development, with fine grain of detail that enables social and entrepreneurial initiative to thrive in an informal conjunction with core health care functions. Thus, it has been gratifying to see the general arrangement of the New St Paul’s precinct, particularly as expressed in option #2 for the precinct planning. This “High Street” approach best supports a wide range of convivial activity, both short term, and through long term build out, as it is based on continuity of supportive layers of pedestrian activity. While the Gore Street connector is the key essential ingredient for either of the site planning options, the implicit message of Option #1 is more of the model of institution as monument, with a centralising focus on vehicular arrival and a somewhat vacuous gaptoothed assemblage of urban space. In the course of considering New St Paul’s in the context of our learning from the DVA Roundtables, we have become sensitised to the critical happenstance of the nearby Food Distribution Hub. While the options for St Paul’s do not directly impact the lands to the east of this site, it is important to maintain at the forefront of urban planning consciousness the extreme danger to the sustainable well-being of the City, if the road network arising from the viaducts replacement were to disrupt, and thereby destroy the synergistic functionality of Produce Row. Accordingly the DVA is undertaking a process to reconvene and expand the community of our “Food” roundtable, and will be bring this consideration forward in Ongoing New St Paul’s and False Creek Flats processes. Our analysis amplified our awareness of the extensive inter-relationships between diverse social and economic cultures needing to be served in the eastern Downtown. There are now a series of processes in play that require close consideration of the specific functions of health (hospital), transportation (viaducts and railway), and communities (Strathcona and Industries). They all require economic fertilisation, and no one seed can yield the abundance needed to feed all the requirements of the precinct. Accordingly, the corollary of this problem is the opportunity for mutual benefit in flexible collaboration in how each functional element can combine with others to create the “balanced nourishment” that will enable this precinct to continue to be the backbone of support for the City.